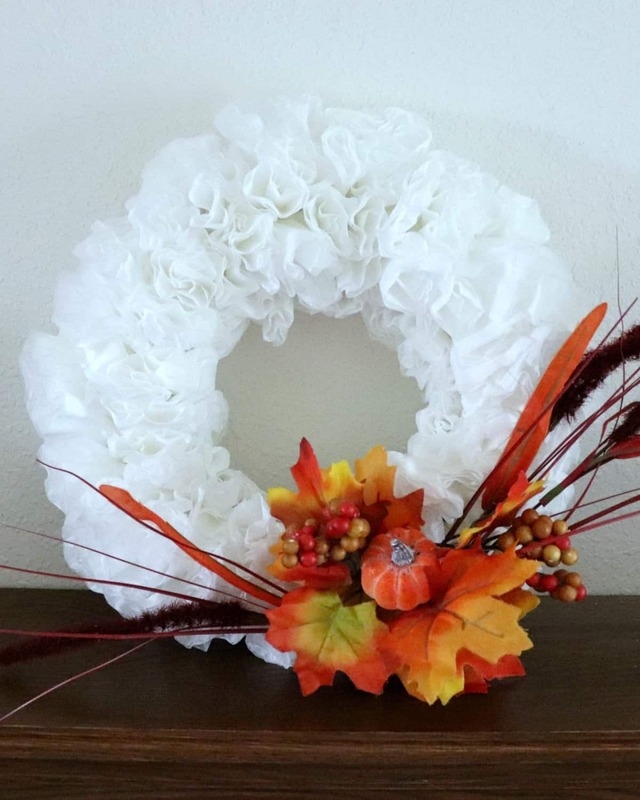 Today I am showing you a $4 fall wreath, yup $4! And it’s beautiful! 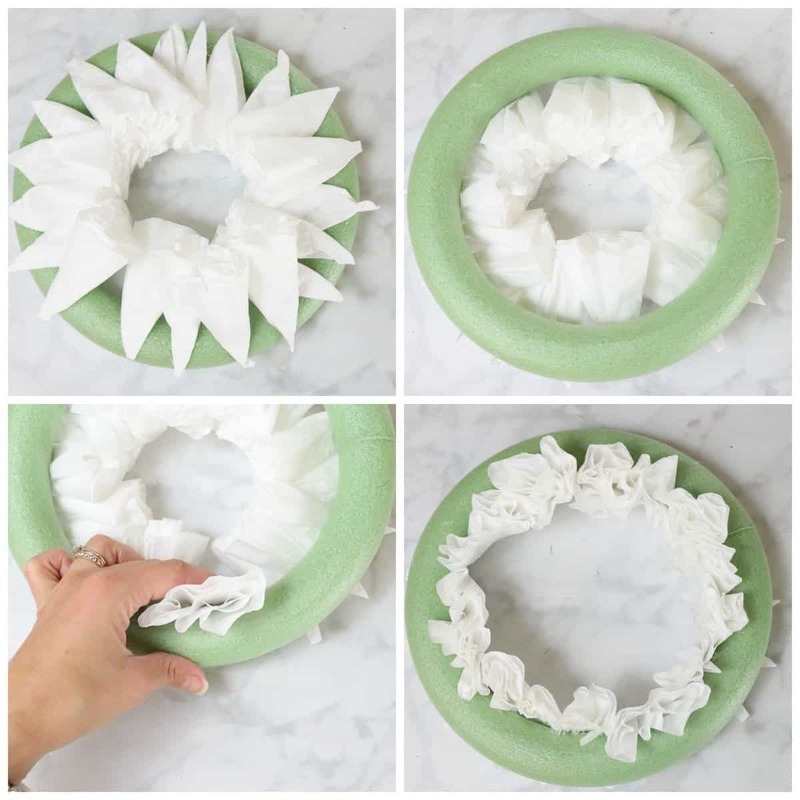 Take a look at this dollar store coffee filter wreath and learn how to make your own. 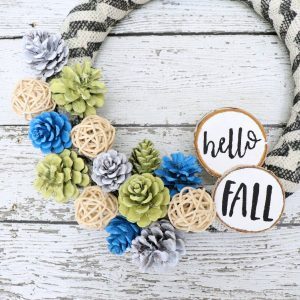 You can also find more dollar store fall projects from some friends of mine at the bottom of this post. 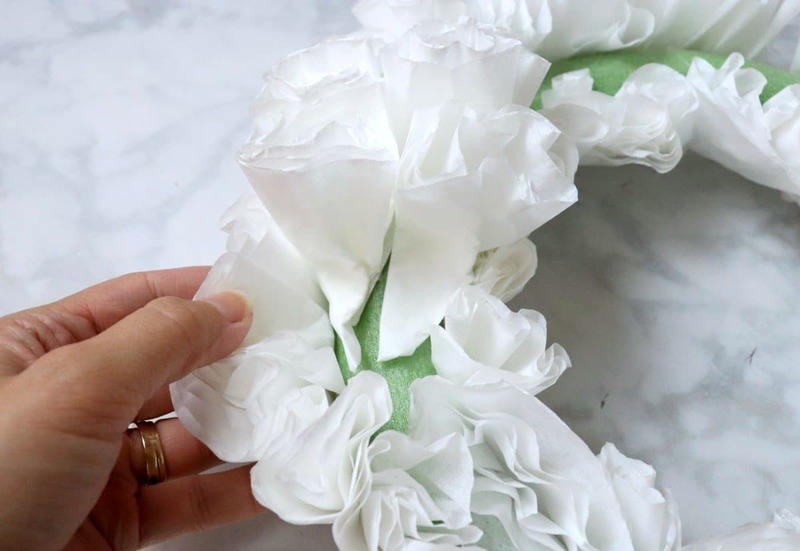 I have admired the beautiful texture and fullness of a coffee filter wreath for a while, but I always felt like it was too involved of a project to tackle. This season it was time to take on the challenge. I headed to my favorite Dollar Tree and picked up $4 worth of supplies, then grabbed my glue gun and a few hot glue sticks and got to work. 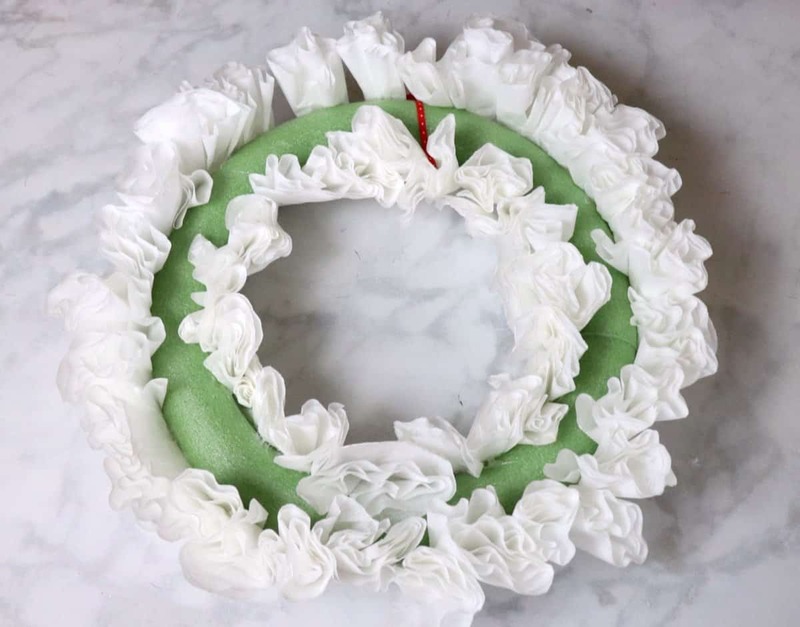 The key to a fluffy and full wreath is lots of rolled filters. I started by folding a filter in half, then in quarters. Next I rolled the quarter and pinched the end to hold it closed, then I repeated this about 100 times. I started attaching these cones with hot glue to the back inside of the wreath. Once I had filters all around, I tuned the wreath over and folded the filters in to cover the inside of the wreath. 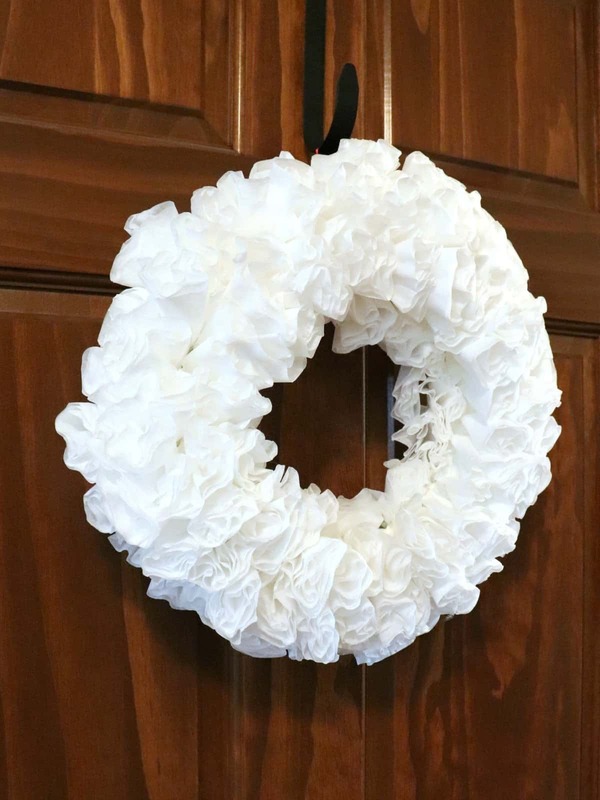 Next, I added filters to the outside and folded them up to create fullness around the outside of the wreath. Finally, I added 2 rows of filters to the middle staggering them and fluffing as the glue dried. About halfway through I tied a ribbon to the wreath form for hanging but this can be done at the end of the project as well. I love how this looks just white against a dark door, I’m thinking this will make a fabulous winter wreath too. 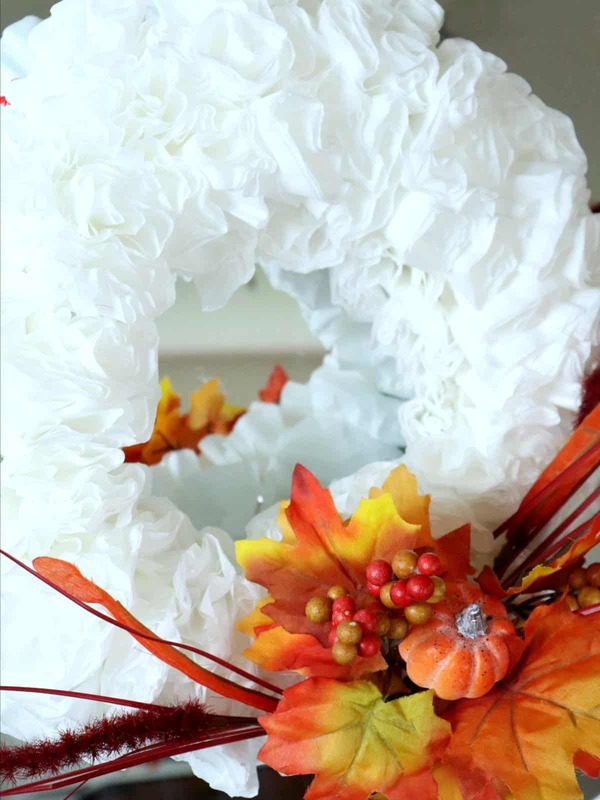 To liven it up for fall I used 2 floral stems with leaves and a pumpkin and wrapped the wire stems around the wreath. I didn’t use anything permanent to secure the stems because I want to remove them as the season changes. I am in love with this wreath. It is hanging on a mirror over my mantle and it’s the perfect size for my space. 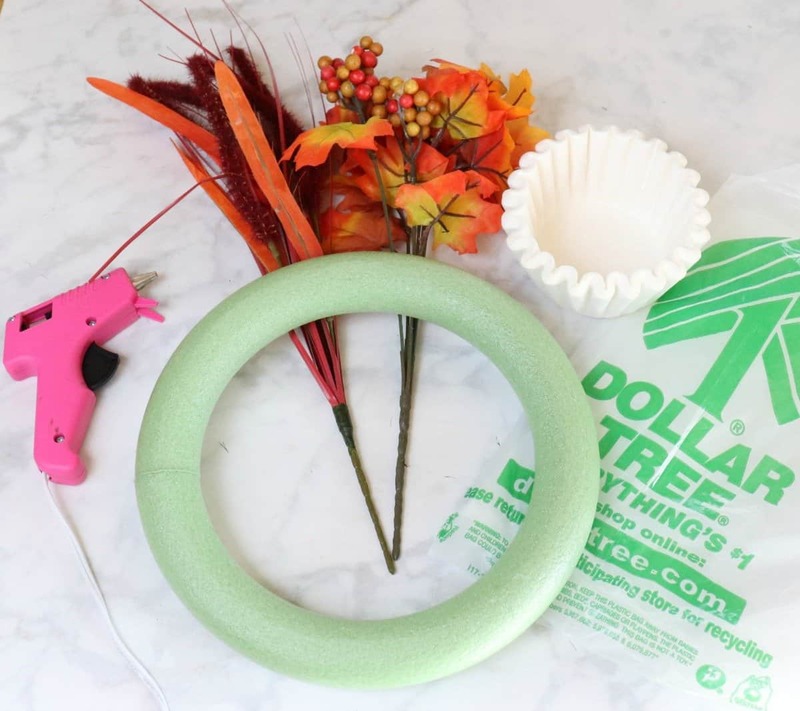 Now take a look at these other fall dollar store projects. 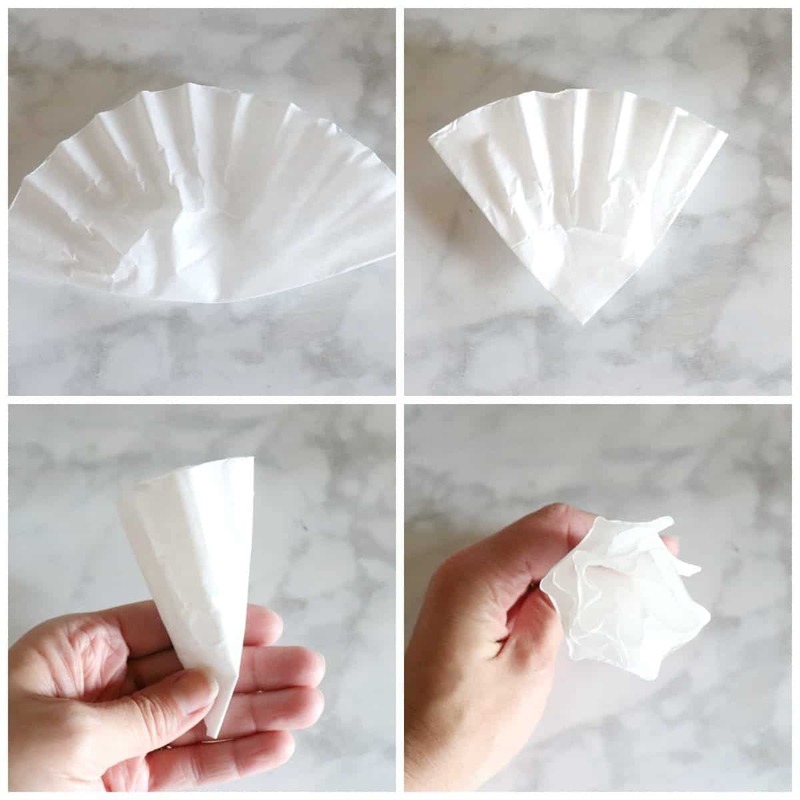 This is such a cool way to use coffee filters! I may have to try it this year!